After breakfast transfer to Delhi Golf Club. The 6972 yards, PAR 72, 18 Hole Golf Course was redesigned by Peter Thompson in 1977 - 78. This golf club in Delhi was chosen to host the first ever golf tournament at the Asian Games in 1982. The Club also has a Nine Hole B Course used primarily by beginners. The first hole on the main course is a 522 yards, PAR 5, which doglegs to the left around a thorny bush rough. Rest of the day for leisure. Overnight stay at hotel. 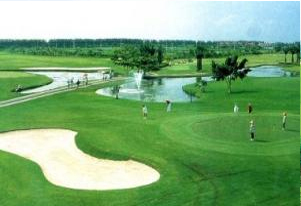 After having breakfast you will be transferred to Delhi Golf Course full day for guided Golf playing. Evening free for your own activity or free for shopping around the local market. Overnight stay at hotel. After breakfast drive to Agra. En route visit Sikandra, the Akbar’s tomb. On arrival at Agra our representative assists in your check in process at the hotel. Afternoon visit the Agra Fort which has the Pearl Mosque, Diwan-e-am (the hall of public audience) and Diwan-e-Khas (the hall of private audience). Evening free for shopping the local market. Overnight stay at hotel. Morning visit the famous Taj Mahal in sunrise, built by Mughal Emperor Shah Jahan in memory of his wife Mumtaz Mahal. This monument is made of white marble and it took 22 years to get constructed. After breakfast drive to Jaipur, en route stop at Fatehpur Sikri. Fatehpur Sikri was built by Akbar, the Mughal emperor between 1571 and 1585. It is one of the finest examples of Mughal architectural splendour. It was constructed mainly as a tribute to the great Sufi saint Shaikh Salim Chisti who had blessed Akbar with a son. 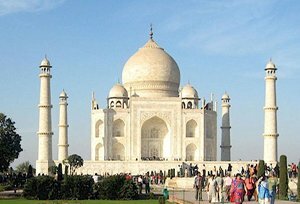 Though the city is in ruins, it is a must visit place for those who visit Agra. On arrival at Jaipur, our representative will assist you in the hotel check in process. Overnight stay at hotel. After breakfast, enjoy a full day sightseeing tour of Jaipur. Enjoy a safari up to the famous 17th century Amber Fort. Thereafter, visit the enchantingly beautiful City Palace, a fine blend of Rajasthani and Mughal architecture, now housing a museum containing rare armories, manuscripts, and paintings. Later, visit the Hawa Mahal (Palace of Winds), the landmark architecture of Jaipur built of pink sandstone. You will also visit the Jantar Mantar, an Astronomical observatory built by maharaja Jai Singh in 1728. Overnight stay will be at the hotel in Jaipur. After breakfast drive back to Delhi. On arrival at Delhi transfer to Airport for your onward destination.